The magnificent MS Amadeus Silver III vessel is the newest addition to the award winning Amadeus Silver fleet that includes the premium 135 meter MS Amadeus Silver and MS Amadeus Silver II vessels. The new beauty is based on an already successful design model while incorporating several new, exciting features that add extra elements of innovation for which the ‘Silver’ fleet is renowned. For example, passengers have the option to book cabins with connecting doors on the Haydn Deck. This premium vessel comprises of twelve luxurious suites with a private exterior balcony and a cozy reading corner. The 72 standard cabins come with panoramic window fronts that can be automatically lowered and modern amenities which include a walk­in wardrobe and a stylish bathroom. Spacious public areas such as the elegant ‘Café Vienna’ and glass shielded, open air ‘River Terrace Lounge’ provide an inviting ambience in which to relax and unwind. Like its impressive sister vessels, the MS Amadeus Silver III riverboat was also commissioned by the reputed De Hoop shipyard in Lobith, Holland. 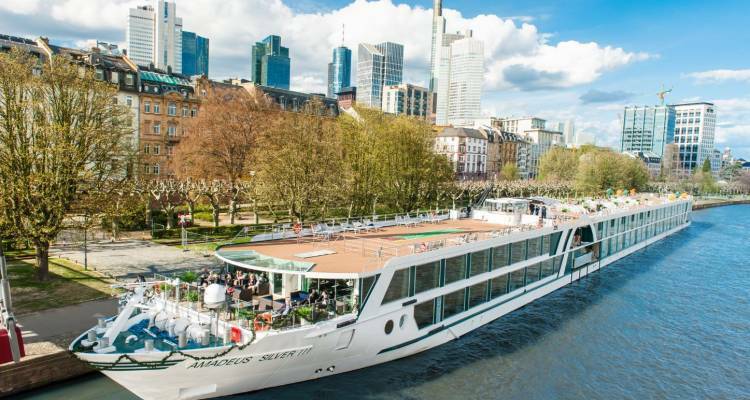 Passengers will now be able to enjoy breathtaking tulip cruises in Holland and Belgium as well as charming Rhine cruises from Amsterdam to Basel in the utmost comfort and luxury. At 188 square feet, the 72 cabins of the Amadeus Silver III offer spacious accommodation for passengers on the vessel. While cabins on all decks have panoramic windows that provide stunning views of the passing scenery; the ones on the Mozart and Strauss decks have special windows that convert into open French balconies and offer unimpeded views of the charming countryside. All cabins include modern hospitality amenities such as a comfortable bed, TV, separate area for WC/shower, writing desk, chair, a cabinet to store belongings and a safe to secure valuables. Enjoy the highest standards of cuisine aboard the AMADEUS Silver III in the stylish Panorama Restaurant, which offers sufficient room for all passengers at one sitting, and where our kitchen crew will ensure that you are spoilt beyond your expectations. Coffee-lovers will enjoy the on-board Café Vienna, which offers a wide variety of authentic Viennese coffee-time specialties. The perfect place full of tradition: Indulge in the cozy flair of a Viennese coffee house, where passengers are treated to the typically Austrian specialities of coffee and Sachertorte with much more on its menu too.